First, cut off 18-20 inches of floss and wind most around one of your fingers. The remaining floss can be wound around your other hand. Grip the floss tautly between your thumb and forefinger. Moving the floss gently between your teeth, catch food debris and other particles that are stuck. Never snap the floss into your gums, it can cause bleeding and tissue damage. 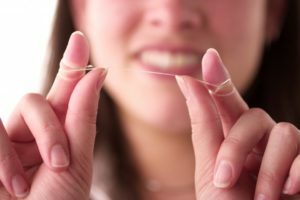 When your floss does reach the gum line, don’t cut into it. Move the floss against one tooth, and make a C-shape, gently sliding it between the gum and tooth. Lastly, hold your floss against your tooth and rub the side with it. Be sure to also move it up and down along with this motion. Repeat this process for all your teeth, including behind the back teeth. After you’re all done flossing, throw it away and be sure to never reuse bacteria-ridden floss. Should I Brush My Teeth Before or After Flossing? No matter how you complete your oral routine, it’s important to just do it. If you’re thorough and careful about brushing and flossing, it shouldn’t matter what order you do them. Be sure to save at least 5-10 minutes for oral care and try not to rush through it at the end of your day. Remember that flossing and brushing should never be painful. If it is, you could be applying too much pressure, which could damage your gums and tissue. Your preventive routine should include brushing twice a day, flossing once a day, and rinsing with an antibacterial mouthwash. Doing this every day can prevent gum disease, tooth decay, and other harmful oral problems. In addition to your daily oral hygiene, you should be scheduling semi-annual cleanings with your dentist. This helps to remove built-up plaque and tartar that you’re unable to clean off yourself. Drs. Suzan Rismani-Flenniken and Neil Flenniken have been providing the patients with the highest quality of dental care for decades. Whether you’re coming in for a basic checkup or oral surgery, Flenniken Family Dentistry can save you time and money by being your one-stop-shop. Dentistry is a family affair for the Flenniken’s, so they provide each patient with the own gentle care and treatment that they would want. If you have any questions or to schedule your semi-annual checkup, please visit our website or contact us at 717-836-1259.